BBQ Up a Storm With New Packington Recipes | Packington Free Range | Born and reared outdoors. Always. So after a very, very long winter, and a pretty snowy spring, the summer of 2013 is finally shaping up to be a lovely one! After a few weeks of sunshine, balmy temperatures, and Brits manically raiding the supermarket shelves for BBQ supplies, Packington has created new recipes to hopefully keep your BBQ inspiration alive! 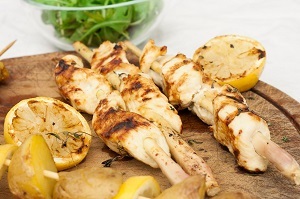 For those of you who love your chicken, our zesty Lemongrass Skewers are sure to go down a treat. Simple, quick and delicious, cooking your chicken kebabs on lemongrass sticks instead of metal skewers adds an extra, welcome kick of flavour. The second recipe packing a flavour punch is inspired by the Moroccan palette. Pork is usually overshadowed by the ever popular burger when it comes to the BBQ stakes, but we (despite being biased) believe it deserves more credit. We’ve specifically used tenderloin cut for this recipe as it absorbs the flavours beautifully thanks to the tenderness of the meat. A tantalising blend of paprika, harissa and coriander brings the taste buds to life and definitely adds a punch of flavour. Hopefully the sun will shine on us for a few more weeks yet and we can all have the chance to trial these extra special BBQ recipes! They’re definitely much more inspiring than sausages and burgers.